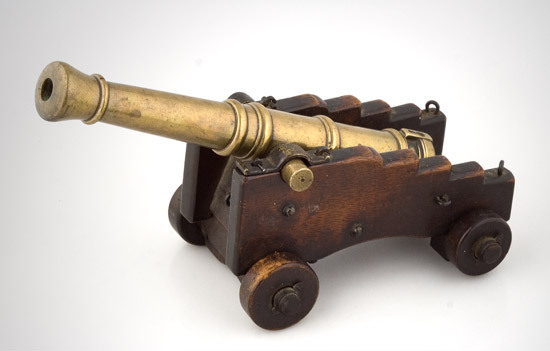 Presented here, a very special 18th Century Model Cannon. As a long time nautical collector I have had an interest in cannons since I found my first "Strong" signal cannon in the late 1970's, purchasing it by mail from an East Coast nautical dealer. Over the years,I have had quite a number of cannons, from small models up to the large USCG BRONZE LIFESAVING CANNONS OF DAVID LYLE. From my current experience, good ones (age & quality) are quite rare today. This is one I purchased about 40 plus years ago and has been in my collection since that time. It is, I feel, one of the earliest I have run across, dating it to the 18th Century. The wear on the wooden frame is extensive from handling as one finds in early furniture and treen ware. The cannon casting shows the same handling "smoothing" that one sees in 15th thru 17th century candlesticks. In some cases this is due to extensive polishing which could also be true of the cannon barrel. The wheels have retaining pins holding them onto the axle. These are nicely hand forged with small decorative detail on the head of each. The right front wheel has an inset brass ring to guard against splitting of the axle or other damage from usage. The other three wheels have the recess for the ring but the rings have been lost over time (shrinkage of the axle across its diameter), not unusual in metal bindings of all sorts of metal to wood parts over time. The patination of the mahogany carriage is exceptional. Dimensions: overall 10" carriage 6" x 5".